What is a public servant? In general, the men and women who fill the roles of public servants are honest and principled people who feel a calling to the work. They may be teachers, librarians, police officers, firemen or social workers, elected officials such as mayors, administrators, city and county managers, sheriffs, state or national representatives and more. The common tie that binds them is a desire to serve. However, serving is sometimes not enough -- everyone has met that one teacher, or officer, or city worker, who seems truly content, extremely helpful, the person who goes "above and beyond" in his or her work. These truly inspired, dedicated, and happy individuals may come from a wide variety of backgrounds, but they share something special: the vision to carry them through. 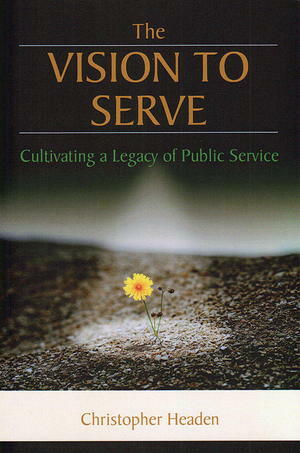 This book is a way to share my own experience in public service, but more importantly, the lessons I have learned from others as mentors and as "ordinary" men and women whose simple actions make them great leaders and great examples for all of us to follow, as they pass the baton to the next generation of people who serve. If you seek a career in public service, already serve in some capacity, or are just interested in the truth behind the people who serve you as a citizen of your community, this book will inform, educate, and inspire you. If you have a desire to serve and change the world through changing the community that you live in, then this book is for you.